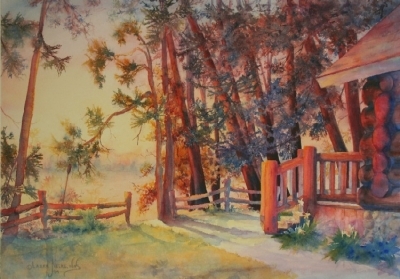 Laura Nelke works closely with prospective patrons to create unique pieces that reflect the memories of a special time and place. Contact the artist for further details. Click on a piece to view larger and read the Artist Statement for that piece. Once there was a tree...and she loved a little boy. ...And the boy loved the tree...very much. Traditionally a “family tree” is used to represent the complex history and the relationships among family members. Whether sturdy or broken, straight or twisted, healthy or diseased, fruitful or barren, every individual is a branch on his or her personal family tree. The trunk of that tree is the great unifier which connects the disparate branches into a living whole. The family draws strength from its history, often hidden, like deeply buried roots. Fed by our roots each of us becomes an outgrowth and beneficiary of the nurturing labors of past generations. 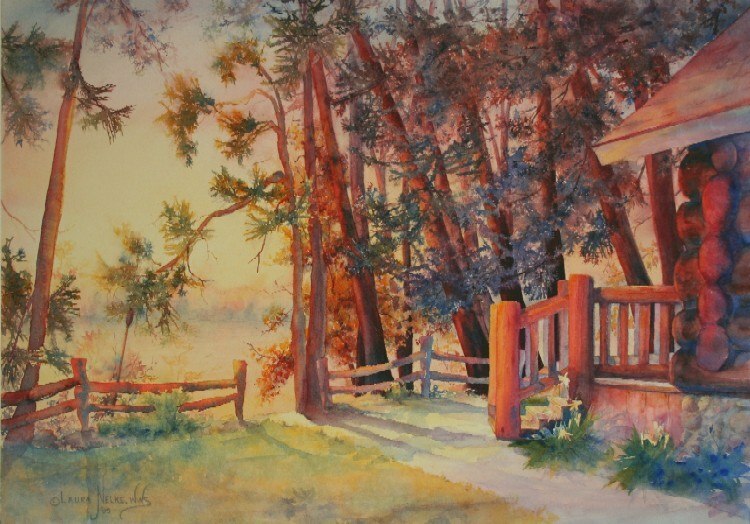 My painting pays tribute to the patron's family, and its trees. To pass through a doorway is to embrace change—a transition from an old place to a new. This can present challenges, opportunities, and growth, but at the same time it is often stressful, scary, and possibly even dangerous. This year it has been my personal challenge to navigate through several of life’s passages, both joyful and sorrowful. When confronting the unsettling agents of change it helps me to focus on the beauty and constancy of nature’s rhythms and eternal cycles of renewal. Harvest is the most obvious visual metaphor for such a mindset. This is a time for the gathering-in of rich bounty. The land blossoms with one last explosion of glorious color before hunkering down to face winter’s barren chill. Seeds are set and dispersed in the winds of autumn—already the promise of new life is made before old life is made dust. My painting tries to strike a balance between the vaguely threatening nature of change and the beauty of its challenges. The composition is framed by the broken jaws of an old barn door, but the view is golden with autumn’s beautiful offerings. The flowers bloom in tribute to the patron, a Master Gardener who finds solace and peace in her garden. She brings joy to those who know her, and enjoys life with relish, despite those occasional weeds! The image of Jackson Harbor, its buildings, and docks was one I sketched and photographed years ago while waiting to board the ferry to Rock Island. 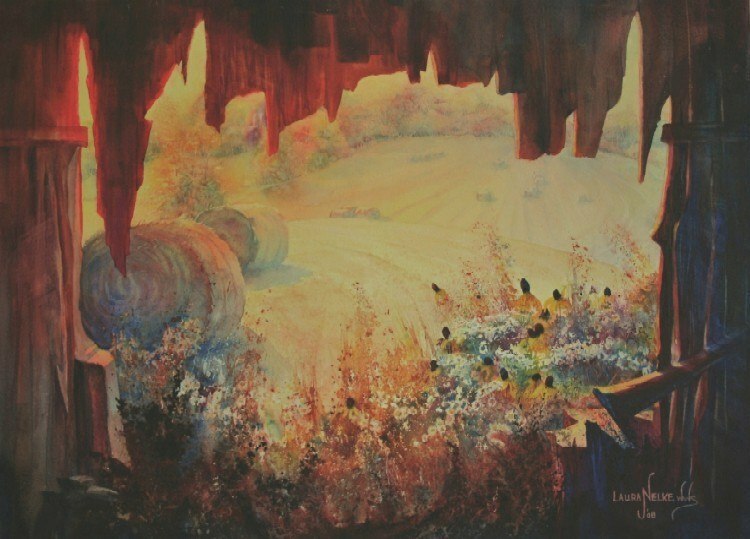 This particular painting is a commission, however, so the emotional content is influenced by the needs of my patron--that is, to commemorate a 50th Wedding Anniversary. I used the theme of “reflections” as a natural way to integrate the watery subject matter of Jackson Harbor with the ultimate intent of the painting—to reflect on 50 years of married life shared on Washington Island in Door County, Wisconsin. The names of the anniversary couple appear on the stern of the fishing boat and make this painting uniquely theirs. Another, more subtle, reference to the couple is the pair of daisies on the foreground dock. Since daisies were the flower of choice at the couple’s original wedding it seemed logical to include them among the wildflowers. The pair of daisies in the foreground is echoed in the middle distance, where two additional daisies symbolize the couple’s two offspring. As is the case with most memories this memory of Jackson Harbor idealizes and distorts where necessary. Space is compressed and the size of the buildings is exaggerated in order to emphasize the sense of place. Since the red barn was particularly significant for the patron, it dominates the painting and attracts the viewer’s eye. The assortments of wildflowers in the foreground and middle distance bloom with abandon, but in reality the ubiquitous Black-eyed Susans are the only flowers the viewer can identify with certainty. I'd dreamed of visiting Hawaii, but when this commission was proposed a dream was as close as I could come to experiencing that place whose very name evokes images of paradise on Earth. 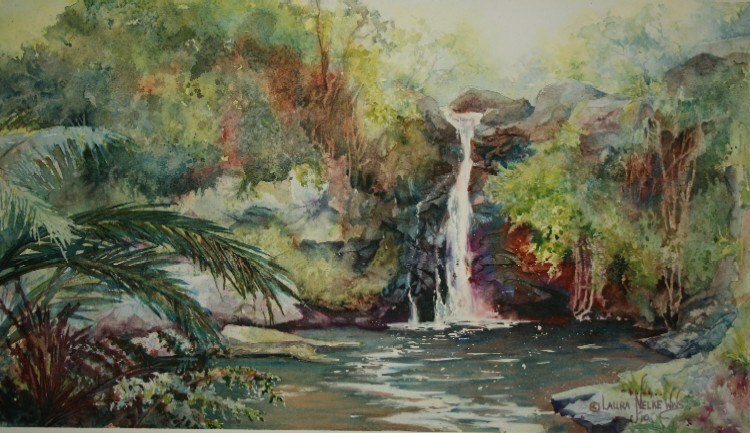 Like Adam and Eve in exile, I am reduced to the realm of imagination when trying to recreate in watercolor the essence of this tropical paradise. Imagine: secluded grottos carved from cool rocks—such ancient rocks, the molten manifestations of goddess Pele’s hot temperament; wild varieties of foliage in bountiful abundance scenting the air with moist and heavy perfumes; refreshing waters misting the air and splashing into jewel-toned pools. Is it any wonder that these patrons elected to celebrate their 25th wedding anniversary in this modern-day Eden? As I considered how to approach the alien subject of Hawaii I found myself focusing on this beautiful waterfall in the Valley of the Kings. 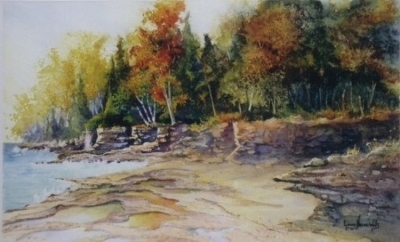 I love the challenge of painting water, and the medium of watercolor is uniquely suited to capturing the elusive nature of this liquid. Wisdom tells you that you never can dip your foot into the same water twice, because water flows onward and is ever-changing. Likewise a strong relationship between a husband and wife requires a fluid dynamic--a willingness to accept change, as well as a desire to repeatedly return to the same waters for mutual refreshment and renewal. The key to the meaning of my painting is found in the symbolism of the water. Who can resist the energy and drama of fall--that season when summer's lethargy is exorcised by blasts of crisp air, and trees are aflame with riotous color! This is my favorite season and a perfect time to visit beautiful Door County, Wisconsin. Over the years I've accumulated boxes of photographs from my visits to Door County along with a list of 'must do' activities and 'must see' locations whenever I'm in the area. The tiny county park known as Cave Point is always on my 'short list' of personal preferences when the winds are up and the waters of Lake Michigan are roiling. At Cave Point the limestone spine of the Niagara Escarpment is laid bare, and, when the weather is right, rocks and waves can collide with energy and drama. In some years, however, Lake Michigan's water level drops precipitously. Instead of the percussive thunder of waves reverberating in undercut cliffs, previously submerged rock ledges are exposed. The flat expanses of limestone separate the water from the cliffs and invite exploration; depressions collect water from errant spray and rogue waves and create mini-reflecting pools. In the fall the pools reflect the golds of the season--"Fall's Gold." This painting's title also plays with words, evoking as it does the phrase "fool's gold"--the common term for glittery, worthless pyrite. Like pyrite, the pools' gold is false, a mirage, a mere reflection of the golden reality of the trees. Sadly, however, these tiny reservoirs of trapped water only occur because the total volume of water is declining--this is "fool's gold" indeed!